Ground Control adjustable camber/caster plates. 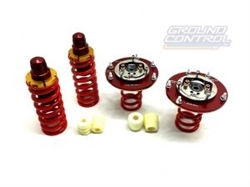 Designed to with any aftermarket damper package(MCS, JRZ, Ohlins, ect). Also includes spring hats to match 2.25" or 2.5" inner diameter springs. Eibach Race Springs. Any spring rates and lengths available, as well as the option for 2.25" or 2.5" inner diameter springs. Ground Control rear ride height adjusters, including spring perches to work with 2.5" or 2.25" inner diameter springs. Ground Control strut and shock bumpstops.